A full understanding of the institution of the American presidency requires us to examine how it developed from the founding to the present. This developmental lens, analyzing how historical turns have shaped the modern institution, allows for a richer, more nuanced understanding. The Development of the American Presidency pays great attention to that historical weight but is organized by the topics and concepts relevant to political science, with the constitutional origins and political development of the presidency its central focus. 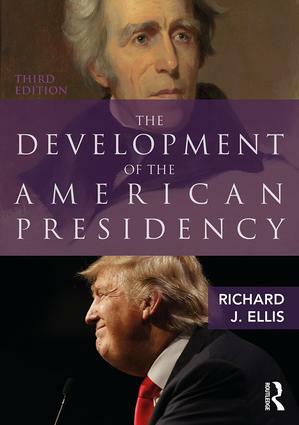 Through comprehensive and in-depth coverage, Richard Ellis looks at how the presidency has evolved in relation to the public, to Congress, to the executive branch, and to the law, showing at every step how different aspects of the presidency have followed distinct trajectories of change. Each chapter promotes active learning, beginning with a narrative account of some illustrative puzzle that brings to life a central concept. A wealth of photos, figures, and tables allow for the visual presentations of concepts. Preliminary assessment of Trump’s place in historical time.